Over the weekend, Lancaster Online published an interesting article on the Amish and Old Order Mennonite schools of Lancaster County. The situation here is unlike most other Amish communities, in that some schools have both Amish and Mennonite students. Lancaster County has a large Old Order Mennonite presence, centered in the northern half of the county. So in those areas, you’ll find mixed classrooms of students and may have a Mennonite or an Amish teacher at the head of the class. In schools operated by Old Order Mennonites you may also find more technology than those run by Amish. Here are 5 interesting facts about Plain parochial schools in the Lancaster County community. 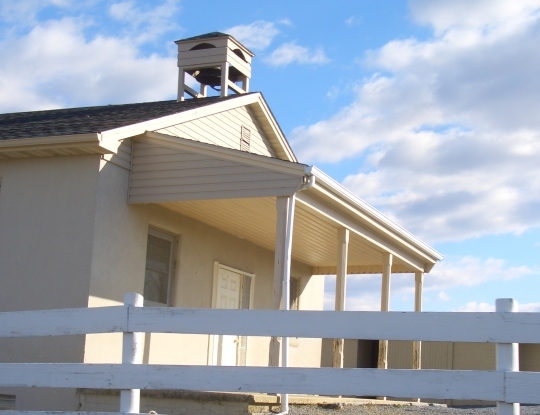 300+ Little Schools – In the community there are 254 Amish schools and 54 Old Order Mennonite schools. All in a single, albeit large, settlement. This gives you an idea of how decentralized Amish schools are compared to their non-Amish counterparts. These aren’t institutions of hundreds or thousands of students, but each has typically 2-3 dozen scholars total. The Teachers – They’re usually young single women (ages 17-20), though sometimes you’ll find male teachers. Pay is low (one example – a local school pays $50-75 per day). Subjects – Math goes up to pre-algebra, reading and writing are taught, along with German language, penmanship, and geography. History and science are minimal. In some cases (speaking about Amish schools in general), you may find health class, art, and some social studies (a wall chart listing the US presidents). In plainer schools, curriculum varies (Karen Johnson-Weiner’s Train Up A Child is an excellent look at the differences across communities). Group emphasis – Schools emphasize cooperation over getting ahead of your neighbor. From the article, “The curriculum and schools discourage competition and encourage cooperation. It’s typical for teachers to have a bulletin board showing when a group has mastered a lesson instead of tracking individual students.” Scholars have to form new ball teams at recess for similar reasons. If you missed it, you might also like this guest post by Rebecca Miller, on 15 differences between Amish and non-Amish schools. “Lancaster Online is published” or rather “has published”? Thanks Dan! That one snuck through. Fixed now. I’m always interested in posts dealing with schools & education in general, being the mother of a Fifth grade teacher (English). 1)	I am really glad that this article was posted, as I was not aware that there even was a large Old Order Mennonite community in Lancaster County. I have had the opportunity to visit numerous Amish communities in multiple states over the years, but have never been in a an OOM community before. When we are Lancaster County for Horse Progress Days at the end of June I hope to correct that situation. BTW: Erik did you get my email about HPD? 2)	This is an interesting article to me because my wife taught various grade levels, including Special Ed classes, in the lower elementary grades for 36 years before retiring 4 years ago this month. I have come to the conclusion that public school education, on the whole, is in a world of hurt and suspect that an over reliance on technology is at least partially to blame. About 3 or 4 years before my wife retired, the district where she taught required all teachers to start using a “white board” system. I never saw the thing and really don’t know how it worked, but essentially it was an electronic version of the old erasable white board. It was also much more than that. It could import lesson plans, you could make ad hoc changes to it and those would be exported to update the lesson plan. The administration could monitor and evaluate lesson plans, classroom application of the system etc. What is not to like about these capabilities, right? Well, nothing really. All of it seemed to work as designed. Where the problem came in, is that there seemed to be a belief, especially noticeable among the younger teachers, that “teaching” consisted of exposing the students to whatever is displayed on the white board and no more. If the students grasp what they are shown on the board; fine. If not? Oh, well … too bad. There seemed to be little ability on their part to tailor activities to the student’s needs if they were not able to comprehend the material as presented via the system. Worse yet, one day there was an interruption in the internet (intranet?) service, and since the white board data base & logic resided on the server at the administration, guess what? Yep, the white board was down and pandemonium was the order of the day for any teacher that was under about 30 years old. And I am on the same page on the electronic white board example you shared. I encountered it once in a classroom context and it just wasn’t my thing. I think time saving and work-enhancing technologies, apps, etc. can be good in theory but we also have to be careful not to let the tech get in the way of the main goal. Thanks for the tip on the OOM community near Ephrata. We will surely drive up that way. We are flying up on that Tuesday AM, so have the PM on Tuesday and all day Wednesday to explore. Going to do the Horse Progress Days bus tour, which in on Thursday, again this year. Horses, Amish, beautiful farm country and Old Order Mennonites nearby … as a bonus. Christmas is coming six months early for me this year! Great to hear it, so Merry Christmas and enjoy the visit 🙂 So unless I’m drawing a blank I think you haven’t been in Lancaster before? Compared to the other communities you’ve visited you’ll probably noticed it is a lot more populated, though still quite rural in areas. This was interesting, especially to learn that some schools have both Amish and Mennonite students. I was wondering if there are similar Amish/Mennonite schools in other settlements. It brought to mind the southwestern Elkhart County, Indiana, area. In that area there are several plain Mennonite groups, plain Brethren, German Baptist, and towards Nappanee, Old Order Amish. I couldn’t find any information in books I have about such schools in that area. Old Order Mennonites in Lancaster county. I do not explore any orders East of the river and I wonder if the Old Order Mennonites in Lancaster County have men with beards. I am familiar with OOM in Synder County. They “Synders” men do not sport beards and I was wondering if the Lancaster OOM have beards. Does anyone have knowledge of this? If you ever get a chance to visit an Amish school, go! It’s fascinating to watch. Each grade is doing a different activity and there is a lot of action with students leaving and going back to their desks, but it’s all done in near silence and in perfect coordination and discipline. I have played “school” for hours with my Amish friends’ younger kids at home. For them, it’s like a dress rehearsal where they learn the ropes. You didn’t mention this in the article, but there is usually little to no homework assigned as well, at least in the OO Amish schools in Lancaster. It’s only given if a scholar is falling behind or needs extra drilling in a subject. The students also help clean up at the end of the school day – no janitorial staff needed. =) Every Amish kid I’ve met really loves school and thinks the world of their teachers.